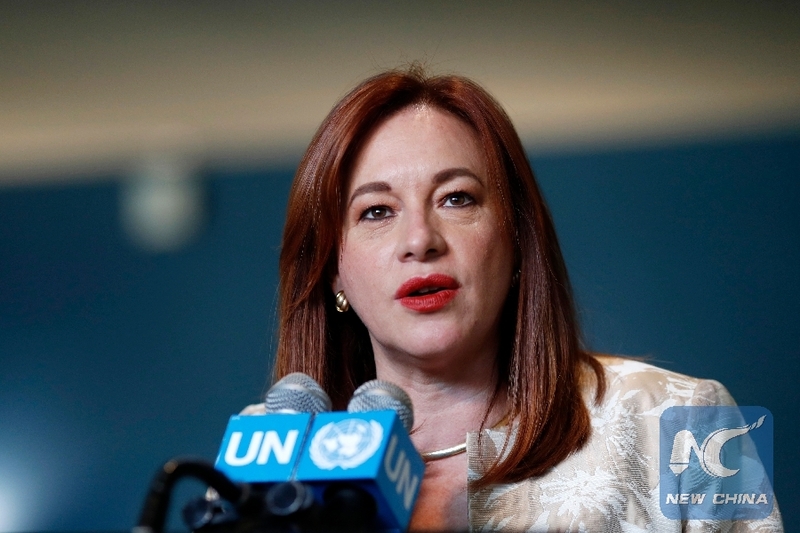 UNITED NATIONS, Jan. 15 (Xinhua) -- The current world needs multilateralism more than ever before in face of many serious challenges, UN General Assembly (UNGA) President Maria Fernanda Espinosa Garces said in a recent interview with Xinhua. "We need more multilateralism, perhaps more than ever before," Espinosa said, highlighting the need for multilateralism that features "cooperation, collective action and global leadership" and allows the international community to have "the capacity to respond and address global challenges through collective action." The world needs multilateralism that "connects the real-time of conflict with real-time of our response capacity," she said. "There is no other way that we have to address issues of climate change, disarmament, terrorism and international organized crime, that need cooperation among nations," she added. Espinosa said the world needs stronger cooperation and "a good quality multilateralism -- multilateralism that delivers." She stressed the importance of dialogue in solving global conflicts. "Dialogue is the most powerful tool that we have to solve and address global conflicts," she said. "There is no other way that is supported by the Charter of the United Nations." Espinosa, Ecuador's former foreign minister, was elected last June to become the fourth woman to hold the UNGA presidency. "Dialogue is the only avenue to build a truly peaceful and prosperous world," she said. Espinosa cheered China's contributions to the United Nations in support of multilateralism. "China is a very important partner ... it has shown a strong commitment to multilateralism," she said. She applauded China's contributions to the fight against climate change, saying "China has done a tremendous effort and has a very strong commitment on mitigation and on its contribution to combat climate change." China has committed to "changing its energy matrix, and to investing in renewable energy in terms of sustainable consumption patterns," she said. Espinosa said that China, which has lifted 700 million people out of poverty in recent decades, is "a very important and reliable partner" of the United Nations in UN development goals such as poverty reduction. "This is really a big success," she said, referring to China's achievement in poverty reduction. "This is also a guiding force and a leading force to meet the 2030 Agenda and the Sustainable Development Goals." Espinosa said the UN has concluded 2018 with big strides such as the adoption of the Global Compact for Safe, Orderly and Regular Migration and the Global Compact on Refugees and the agreement on the implementation guidelines, or a common rulebook, of the landmark Paris Agreement. The UNGA president said this year she is going to carry on with a campaign to reduce the consumption of single-use plastics. She is also planning to organize a high-level event on the climate and future generations in March. She will be joining UN Women in the international campaign to eradicate violence against women. In addition, the UNGA chief will be also joining efforts at the 2019 Global Forum on Youth, Peace and Security, and hosting three days of dialogue on international migration. The priorities of her efforts will be in line with the mandates she has received from member states. "The year is going to be extremely busy," she said.